People think that I criticized Dr. Wayne Dyer, but I just pointed out that he isn’t taking his own advice. Tony Robbins is another matter altogether. His message is derisive and destructive. I watched him on “Oprah’s Lifeclass: The Tour.” I was shocked and astounded when he advised people to be fearless. I can unequivocally state that every mistake I have made in my life has come from being fearless. This message is irresponsible. And there is a reason no one is confronting him. He has a 46-year Jupiter period that has made him bullet proof. The energy surrounding him is so positive it’s blinding people to the nature of this false prophet. Having fear and being fearless are both sides of the same coin. Fear is having no trust in the Universe and fearlessness is having no trust in the Universe. Fearlessness is ego, the first of the seven deadly sins. And they are listed in order. When you are fearless you believe in yourself and nothing and no one else. The results are the same. Failure. The true message is humility and faith that the Universe (or God) will lead you to your greatest triumph. Tony Robbins is a Pisces Sun so you might think that he cares about people — that he is compassionate. But his Venus and Mars are in the cold, solitary sign of Aquarius. Being conjunct they create a push/pull energy surrounding his need for relationships. He needs them and he doesn’t. Usually this makes for a person who is just fine alone. And finally Mars conjunct Venus picks up Libra (Venus’ ruler) which is extremely negative for Mars — creating a passive/aggressive person — who is loathe to be supportive of other people. His focal planet, Jupiter, the relating planet, tells us he likes cults or cultures. No kidding. He created one around himself. Having a 46-year positive Jupiter period (natal Jupiter changed signs allowing it to make new aspect. This one was to predictive Pluto. As it retrograded while in orb, the aspect became very long in duration.) beginning at the age of 31 and continuing to the age 77, Tony Robbins was given the gift of power. And much like Bernie Madoff, he hasn’t used it for anything but his own aggrandizement. Tony Robbins doesn’t care about you. And despite all his success, he isn’t the happiest man on the planet. Because when you don’t care about anyone, you’re all alone. There is extreme angry towards the father (Moon square Saturn). And again, there is no upside to anger. It eats you alive — unless Jupiter is there to protect you. 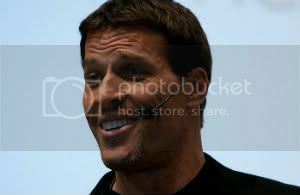 Tony Robbins is a perfect example of money not buying happiness. This is an observation not a judgment. Please leave your comments on Xtrology’s Facebook (https://www.facebook.com/Xtrology) page.